According to suicide prevention researcher and homeless advocate, Gerry Georgatos, homeless friendly precincts must be established across the board as a minimum standard in response to homelessness. Georgatos states, “Homeless friendly precincts will provide that sliver of human dignity.” A sweep of support is lending hope to the establishment of homeless friendly precincts. Support has been accumulating for homeless friendly precincts. In recent weeks, City of Perth Lord Mayor Lisa Scaffidi has pledged her support. The City of Perth is working on proposing a location within its jurisdiction. Georgatos has also been invited by the City of Perth to present the concept to one of the council’s steering committees. The City of Wanneroo Mayor Tracey Roberts was the first to pledge her support and it appears that the City of Wanneroo shire will lead with the nation’s first homeless friendly precinct. Mayor Roberts already has her shire’s planning and community services departments working on the proposal. Last week, City of Fremantle Mayor Brad Pettitt also pledged his support and is taking the concept to his councillors where it is likely to be supported. Shelter South Australia Director, Dr Alice Clark has also flagged her support. Thus far the concept of homeless friendly precincts is about showers, laundries, storage, access to treatment daily, a meeting and safe space but it can be whatever more the shires want it to be. Lord Mayor Scaffidi has suggested a dining area, a food hall while others have suggested including various forms of shelter and computer facilities and WiFi. 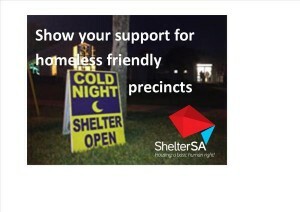 “Shelter SA supports Gerry Georgatos’ idea, put forward in his article in The Stringer and elsewhere to create homeless friendly precincts. According to Jennifer Kaeshagen, Director of the First Nations Homelessness Project, “It’s time for homeless friendly precincts. Safe spaces where people experiencing homelessness can go to 24/7, no waiting lists, no questions asked – people’s privacy, sensitivities respected. Places where the compassionate public can drop off donations to. Places designated, designed for people experiencing homelessness, places they will not be moved on from, shamed. Places that belong to them.” Shelter SA agrees, “social and affordable housing is a must, but in the meantime we should be implementing homeless friendly precincts as a matter of urgency,” said Dr Clark.